Incorrect diagnosis and treatment will delay or prevent any healing process, rapidly becoming acute and chronic. Heel Clinic patient data over many years has clinically proven the only long term solution to cure Plantar fasciitis is to treat the source (root cause), not just symptons. The Heel Clinic has specialised in treating foot, ankle and heel pain ailments such as Plantar fasciitis for the past 15 years. Some years ago the Heel Clinic made breakthrough in our diagnosis and identification of the underlying cause of constant heel pain. Plantar Fasciitis is a modern ailment brought about by the changes in lifestyle over the last 50-60 years. That is; daily surfaces are much harder, the workplace, home, shopping centres, footpaths, hospitals, schools and even some sporting venues, are concrete. Hence to accommodate, footwear is generally softer and cushioned, lacking support and stability. Add to this the fact that we now live longer, are heavier and far more active. The foot structure cannot evolve quickly enough, hence Plantar Fasciitis is just one manifestation of these changes. Plantar Fasciitis is the pulling and micro tearing of the large ligament type structure under the foot called the plantar fascia at its insertion point at the heel. See figs. 1, 2 and 3. Common symptoms for patients are: – pain first thing in the morning, aching and throbbing in the evening, pain when standing up after sitting or lying down and severe pain after sport or exercise. The causes of this inflammation and tearing vary from patient to patient. From the Heel Clinic’s experience in treating over 10,000 patients, age, weight, long periods of time on feet at work, excessive forefoot sports or activity and starting exercise after years of inactivity, appear to be the most common reasons. But it is most certainly a weight-bearing functional problem of the feet. 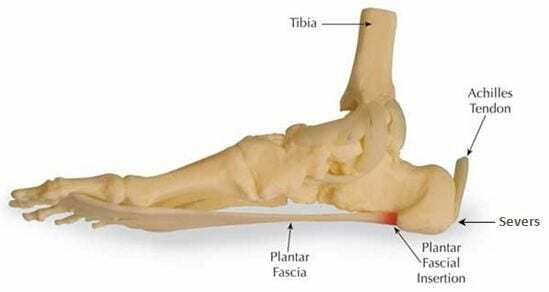 Under normal conditions the structure of the foot supports body weight, but when that structure is no longer supportive (for reasons quoted above); the plantar fascial ligament takes excessive load. After time, (perhaps years) the fascia tears at the attachment point of the heel, hence acute pain. Bony spurs can develop as nature’s way of trying to repair itself but is rarely associated with the pain itself. What is often not understood is that normal daily routine (standing, walking etc.) overloads the fascia. Standing for long periods, sport, exercise are just contributing factors. The Achilles tendon is made up of collagen fibres and does not have a good blood supply. As we age the fibres of the tendon become less force transmitting and less flexible leading to an increase in risk of injury. Dull pain usually in one foot ‘feels like a stone bruise’ – develops over 3-4 weeks. With continued daily routine, activity, sport, work etc., pain intensifies. Pain first thing in the morning, immediately on weight bearing. Simple calf muscle stretching, ice, good supportive footwear and rest may relieve Plantar Fasciitis in these early stages. After this early period the pain can continue to intensify. Patients try anti inflammatories, heel cushions, physiotherapy, acupuncture, arch supports, massage, heat, orthotics, rolling the foot over cans/bottles/golf balls etc. and cortisone. By now most patients have ceased or greatly reduced their activity. Intense pain now for probably 6-12 months, mostly all day, still usually consistent in one foot. Most patients have tried a vast array of treatments including multiple cortisone injections and have stopped all exercise, sport and sometimes jobs. This has obvious physical repercussions resulting in depression and negativity. In desperation, patients will try any solution and well meaning advice. Surgery is still being suggested in some quarters as a final solution. Plantar fasciitis pain develops in “good foot” due to compensated body load (limping). Secondary pain in knees, hips and lower back due to incorrect foot alignment and posture are common. Substantial increase in weight from lack of exercise adding to the load. Pain can be acute and time frames of up to 5 years are not unusual. Pain can dissipate completely as the body adapts, but usually at great personal cost and lifestyle changes. This seems to be between 2 and 5 years. Research shows in nearly all cases it will return as the patient increases time on feet again and returns to activities. This is due to patient’s foot type and the inherent weakness. Plantar Fasciitis can potentially be a lifetime ailment. For more information or to book a consultation phone us on 1300 855 853or Enquire Online. We currently consult in Sydney, Parramatta and Brisbane. 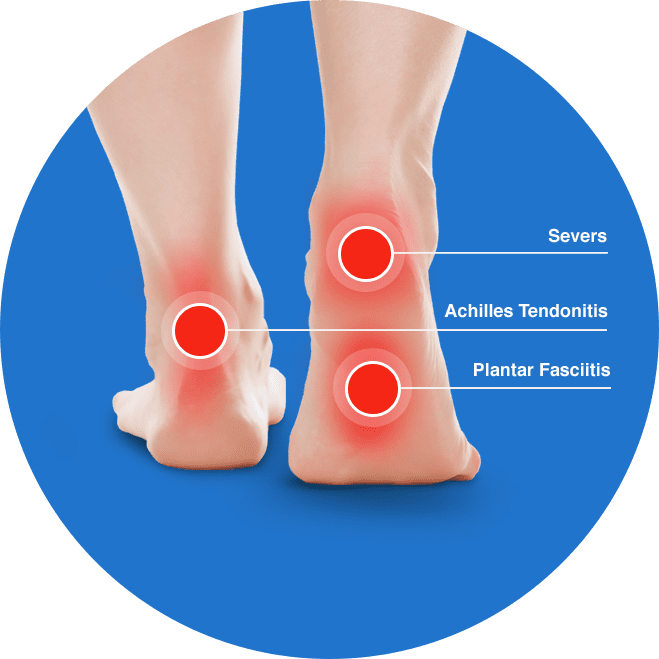 The Clinic’s prime objective is to treat the source of heel pain providing not just short-term relief, but a permanent long-term cure and prevent reoccurrence. This is achieved by applying the Clinics exclusive ITC method of treatment. Together with an individual programme provided by the Clinic. Clinic data has shown has us conclusively long term heel ailments are associated with calcaneous (heel bone) position through the walking gait. This creates a “chain reaction” of forces and loads causing overuse pain. Resulting in Plantar fasciitis pain being predominantly an angulated heel position issue, not ligament, tendon or arch problems. Using new advanced methods and the most up-to-date international research, the Heel Clinic has fully treated 15,000 patients applying our unique Inverted Calcaneous technique (ICT). Clinic treatment has been researched and developed by the Heel Clinic and is not available elsewhere. This technique can now provide patients with a permanent cure not just short term relief. Your first step to a full recovery is a consultation for diagnosis and explanation of the source of these complex ailments. From this assessment the source and the treatment options can be determined. In order treat your ailment efficiently, one of our consultants will contact you to discuss the history of your ailment. We’ll arrange an appointment for you to come in to the clinic for and assessment. Full diagnosis and assessment at our Sydney Clinic.